Wright Asphalt’s Tire Rubber Modified Asphalt Cement Technology (TRMAC™) provides sustainable and environmentally-friendly alternatives to traditional asphalt products. The TRMAC™ absorption process completely digests and incorporates recycled whole scrap ground tire rubber into asphalt cement. Terminal Blended tire rubber products are combined into various finished products, which are used for high performance chip seals, surface sealers and hot mix binders. We have used 1,503,786 tons of tire rubber modified binder in pavement maintenance and hot mix applications, which required 158,674,494 pounds of tire rubber and saved 11,333,892 tires from ending up in a landfill. By using existing tires, Wright also reduces the consumption of new product and the energy utilized for processing it. 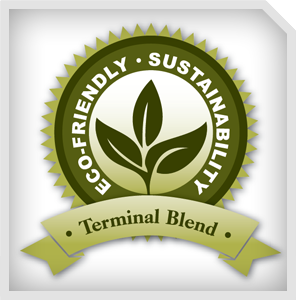 TRMAC based products are sustainable! TRMAC™ based HMA do not cause complications when it is being milled and used as RAP for recycling. By meeting the ASTM D2042 Solubility characteristics of 99% the TRMAC™ based binder will not have any "fillers or tire rubber crumbs" that will prohibit the TRMAC™ based HMA from being recycled and re-blended into new HMA products.